I had expected the start of some weakness this past week, but clearly I was wrong on that front as the Alerian MLP Index impressively closed the week up another 3% at another all-time weekly closing high. I still won’t be surprised to see some pause in this surge in prices, but we shall see what the market thinks. Adjusted CPLP for the issuance of 9.1 million Class B Convertible Preferred Units and for its $130 million acquisition of 2 container vessels with 12 year employment contracts (announced March 15 with a conference call on March 19). Adjusted LRE for a 3 million unit equity offering (deal size was 6 million but 3 million units were sold by its sponsor Lime Rock Resources) at $16.84 on March 18 and for its $38.2 million acquisition of Mid-Continent oil and gas reserves and associated hedges from Lime Rock Resources. Adjusted CMLP for a 4.5 million unit equity offering at $23.90 on March 18. Adjusted HEP for a 1.875 million unit equity offering (deal size was 3.75 million but 1.875 million units were sold by its sponsor HollyFrontier Corporation) at $40.80 on March 18. Adjusted MEMP for its $200 million acquisition of oil and gas producing properties in Texas and Louisiana from its sponsor, Memorial Resource Development. MEMP also approved an increase in the distribution rate to $0.5125 per unit for Q1 2013, a 6.8% year over year increase (announced March 18). Notice that MEMP traded down on the 19th in anticipation of an equity offering, which was announced after market close that day. 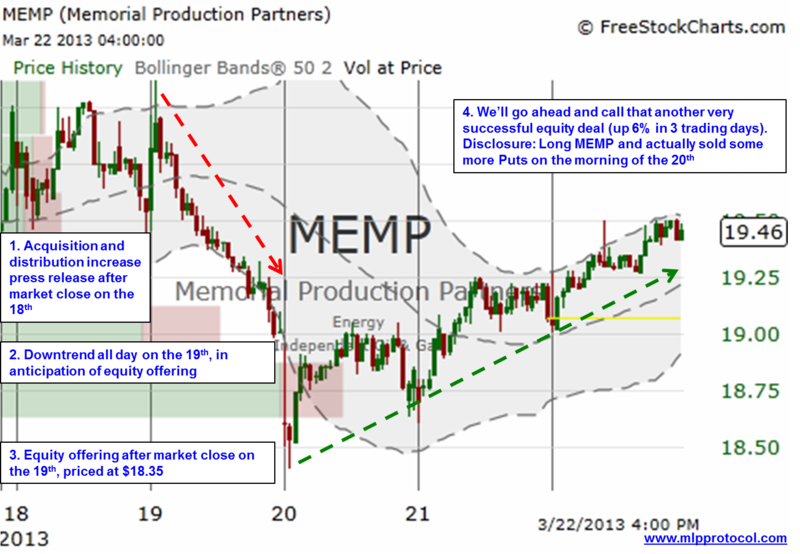 Adjusted MEMP for an 8.5 million unit offering at $18.35 on March 19. Adjusted STON for a 1.4 million unit offering (upsized from original 1.2 million unit deal) at $25.35 on March 20 (please see additional thoughts below). Adjusted the Current Yield calculations for ALDW, CVRR and NTI to use the estimated next four quarters of distributions instead of the “run rate” quarterly distribution estimate (which in all cases is LOWER than the estimated next four quarters to reflect that the current very favorable crack spread environment cannot last forever). On March 21, ETP and ETE announced that ETP will acquire from ETE its interest in ETP Holdco Corp. for $2.35 billion of newly issued ETP common units and $1.40 billion in cash. ETP Holdco is the entity formed by ETP and ETE in 2012 to own the equity interests in Southern Union Company and Sunoco, Inc.